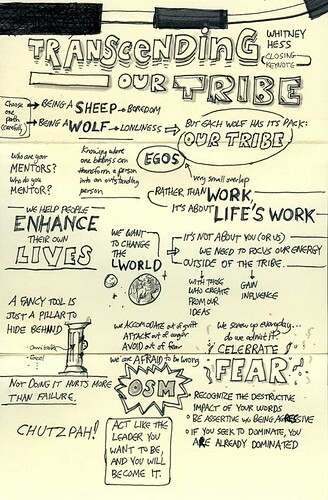 Thirty days later and it has still barely sunken in that I gave the closing plenary at IA Summit 2010 in Phoenix, AZ, titled Transcending Our Tribe. Being bestowed with this tremendous honor was a shock in and of itself, but having actually survived the months of preparation, the intense trepidation, and the profound duration of my time on stage is all the more astonishing. This year was the 11th annual Information Architecture Summit, and my third consecutive year attending. 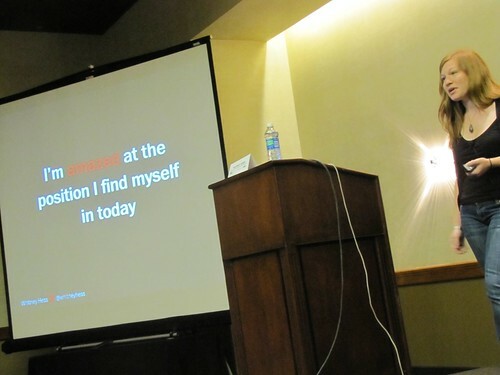 IA Summit 2009 in Memphis, TN, was the very first time that I had given a solo presentation to a public audience — I never could have expected that just a year later I’d be giving the closing keynote. I owe a lot of gratitude to the people who have believed in me at times when I haven’t believed in myself. Jennifer Bombach and Livia Labate, organizers of this year’s conference, gave me an opportunity that I probably didn’t even deserve, and because of their confidence in me, I was able to rise to the biggest challenge in my professional life thus far. 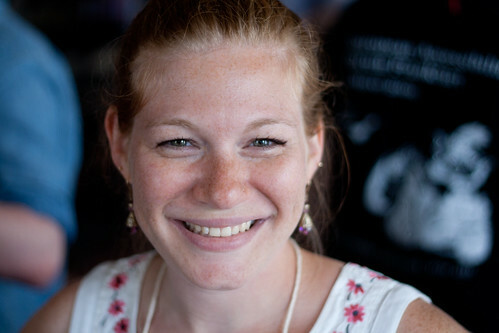 Abby Covert, event producer extraordinaire, became my accomplice in ushering in the next generation of this profession. And the people who had my back, particularly Mario Bourque, made me realize that no matter the outcome of the talk, I would still get to walk away with this amazing group of friends. The day before I left NYC for Phoenix, I was feeling pretty confident in what I put together, and proud of the message that I would be imparting to my community of practice. Then I shared the slides with my boyfriend Orian to flip through. His reaction was extremely uncharacteristic (in a good way). That’s when I knew I had created something special. I stood on that stage thinking, I feel so passionately about what I have to say, that even if no one agrees or cares, it matters so much more to me that I just say it than what people think. So I got up there and I did it for me. Thinking back on my life, I can only remember a handful of moments in which I have been motivated entirely by my own spirit, not trying to be what I think other people want me to be. This was a freeing experience, and it allowed me to be my true self for one of the first times in my life. The fact that what I said meant something to people, maybe even inspired someone to live more authentically and feel better about who they are as a person — well that was just the icing on the cake. I love user experience. I love practicing it and I love educating people about it. But most of all, I love being a part of the most dynamic, intelligent, thoughtful, challenging, ambitious community of practitioners in the workforce today. Being able to make even the slightest impact on these people’s lives is a dream come true. If you are interested in listening to Transcending Our Tribe (it’s 30 minutes), you can follow along with the slides on Slideshare [note: audio screwed up at the moment, Slideshare is working on it], or listen to the podcast on Boxes & Arrows (thank you, Jeff Parks). When the video is live, I’ll be sure to post it here. View more webinars from Whitney Hess. Most designers don’t make the things that people use; we’re ideas people. We’re nothing without the visual designers, developers, copywriters, and business managers with whom we work. It’s time we focus our energy outside the UX tribe, to these people that bring our ideas to fruition. Ms. Hess implores us to stop feeling so disenfranchised and misunderstood, to stop isolating ourselves and strive for the influence to bring about the change that drives us to do what we do. Defending “perfection” will defeat us; instead, she calls us to have the audacity to fail spectacularly and then move upward from those moments. In the end, she asks us to consider our legacy. Do we want to be a footnote in a technology textbook, or do we want to “cross the chasm” and embody the change that we talk about amongst ourselves. Thank you for reading through this reflection. I am incredibly proud of myself for having gotten this far, and doubly proud to be a part of this community. It is only the beginning for both of us. I can’t wait to see what happens next. Great presentation. And I'm psyched to see the Drucker quotes. 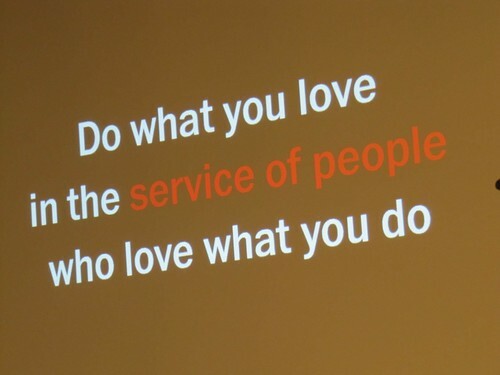 I'm working in my passion and life's work too.